This entry was posted in Anime, Art on March 1, 2019 by Gratian. There was a time.. a long time ago.. when I discovered the Dragon Ball anime. It was broadcast after 2 P.M. in the afternoon – and every single day I was hurrying back home from school to catch the day’s episode of Goku’s adventures. I remember I was mystified, I was captivated by the richness of the story, the complexity of it, and I was living the emotions of each of the episodes. Then.. I started writing down detailed reviews of the episodes, creating a memoir of Dragon Ball facts. I can’t say what happened to those notebooks.. since this was ages ago..
And here I am.. lots of years after watching the first episode of Dragon Ball, not only re-watching the entire series.. to catch up with the new releases of episodes, but also reading the manga and setting up a series of articles in which is discussed the story of the Dragon Ball universe. Dragon Ball (1986-1989) was the first anime released as an adaptation of the manga. The series covers the manga chapters 1-194. Dragon Ball Z is set in the chapters numbered 195-519. I watched Dragon Ball and Dragon Ball Z entirely some years ago..and I wanted to refresh the memory of the story beginning to re-watch the series. The first 13 episodes consist of the Emperor Pilaf Saga. This entry was posted in Anime on February 17, 2019 by Gratian. Kubo Yutaro graduated from Tokyo Polytechnic University in 2012. He is known for animated productions such as 00.08, Kicking Box, Balloon and Crazy For It. His style is unique, effervescent and reinvigorating – using abstract forms and dancing lines and shapes to take the viewer out of the ordinary. Just like other of his animations – Crazy For It begins as a sketch of a simplistic fact of life – a man wants to brush his teeth and in the midst of this peculiar, random and mundane act – flashes of color and imagery of how the mind can wander off when it is not occupied with dilemmas – appear. We see an escape into a world filled with impossible contours, shadows, congruent silhouettes, figures and abstracted symmetry. We observe the materials used in the creation of this short film – colored ink, ballpoint pens and oil-based pastels. The first part of the movie has a white background while the second part invokes a darker one. Also there are tons of nuances and colors used – striking variety and how the mind can perceive reality an transform it into subliminal musical and visual poetry. It is a tale about the limits of creativity and expression of the artist’s potential through a visualized day-dream. This entry was posted in Anime on September 22, 2018 by Gratian. This entry was posted in Anime on September 15, 2018 by Gratian. Over the years the Pokémon world was developed with new ideas and elements which derived from the first concepts presented in the first game ever released. I presented the first generation games in a previous article but now I am going to present in detail – the first part of the long list that comprise the Pokémon affiliated titles. The Pokémon world is the main planet where humans and Pokémon live. The Pokémon world looks and acts like the real world in terms of geography. Each have land-forms, oceans of water and temperatures to support life, meaning that the Pokémon world is about the same size and same distance from the sun as the real world. Humans and nature in the Pokémon world are linked to each other, as many towns are built around the natural environment. The Pokémon world is split into several regions, Kanto, Johto, Hoenn, Sinnoh, Unova, Kalos, and Alola among them. These regions are large land-forms much like continents in the real world, that support a large political region. Off these regions are islands that are not part of any region. These islands are grouped together to create one small region like the Orange Islands and the Sevii Islands. Though there are many similarities between them, there are some major differences between the regions, such as what Pokémon are located there and what legends there are waiting to be uncovered. The natural environment in the Pokémon world is much similar to the real Earth’s environment. Areas with a high density of trees make up forests, landscapes that receive very little precipitation create deserts, while loose broken-up particles of rock make large coastal beaches attracting people and Pokémon alike. The Hoenn and the Sinnoh regions boast many dramatic environments ranging from rain-forests to deserts. The Pokémon world is mainly green and lush, based on factors such as plant structures including trees, shrubs, and grasses. Grass is usually uncontrolled and makes tall grass patches that form prime habitats for wild Pokémon – as seen from the first Pokémon game. Based on this world more than 120 titles were released for the public as official games – and we can add numerous titles to this list because mods and fan-creations also launched during the ongoing development of new generation of games. 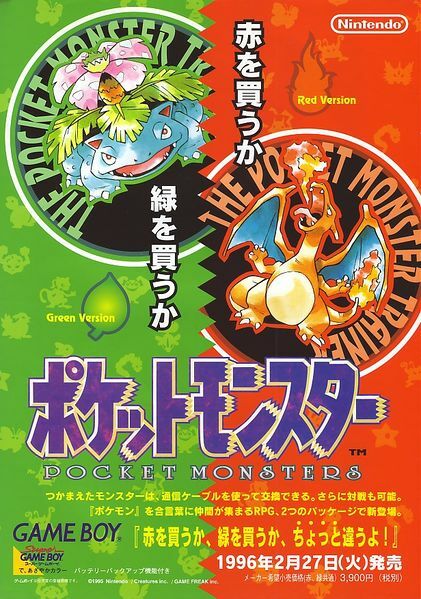 Pokémon Red Version (Japanese: ポケットモンスター　赤 Pocket Monsters: Red) and Pokémon Green Version (Japanese: ポケットモンスター　緑 Pocket Monsters: Green) were the first Pokémon games ever released to the public, in Japan on February 27, 1996. Much as would become standard, Red and Green were later joined by a solitary version, Pokémon Blue, which slightly improved upon their features, and eventually Pokémon Yellow, a second solitary version based on the anime – which allows you to play with Pikachu from the very beginning and not searching for it in the Viridian forest to capture. Red and Green introduced the gameplay concepts that went on to provide the standard for games in the core series and later provided part of the basis for the first international games in the series, Pokémon Red and Blue Versions, which use the obtainable Pokémon from Red and Green and the engine and script from the Japanese Pokémon Blue Version. In 1999, the sequels to these games, Pokémon Gold and Silver were released with the Game Boy Color in mind but remaining playable on the original Game Boy like Red and Green. In 2004, the remakes of these games were released for the Game Boy Advance as Pokémon FireRed and LeafGreen. The FireRed version I plan to play these upcoming weeks since I want to play a Pokemon game similar to the first released but with improved graphics. I used to play it a couple of years back on my tablet and on my phone but I want to make some videos for Youtube so I will use an emulator on my laptop. Red and Green begin the Pokémon series in the region of Kanto, where players play the role of Red (standard name which can be changed at the beginning of the game), a ten-year-old boy who has just started his journey as a Pokémon Trainer from Pallet Town, on the same day as his Blue, who is Red’s rival and the grandson of the local authority on Pokémon, Professor Oak. Oak lets the two boys choose a starter Pokémon, a choice of the Grass-type Bulbasaur, the Fire-type Charmander, or the Water-type Squirtle (and with the player’s rival choosing the Pokémon that has a type advantage over the player’s Pokémon). Oak also gives them a Pokédex and asks them to catch all the Pokémon in the region. You can battle, catch and transfer creatures in order to complete your collection. A good strategy of obtaining all the available Pokemon is by battling and evolving them. But this requires hours of searching the same zones for wild Pokemon and then traveling back to a Pokemon center to heal the owed ones. You can purchase potions for various effects but since you can gain monetary items only by confronting other trainers – you can’t get enough money to continually purchase life potions. Pokémon Blue Version (Japanese: ポケットモンスター　青 Pocket Monsters: Blue) is the third core series Pokémon game for Game Boy, released in Japan on October 15, 1996 exclusively to subscribers of CoroCoro Comic and on October 10, 1999 to general retail as a minor revision of Pokémon Red and Green Versions, which were released earlier that year. It was thus the first solitary version in the core series Pokémon games. On November 12, 2015, a Nintendo Direct announced that Blue will be released in Japan on February 27, 2016, the Pokémon 20th Anniversary, for the Nintendo 3DS Virtual Console. Various fixes in the game include a graphics and sound upgrade, as well as the removal of several known glitches that had been found in the original pair. 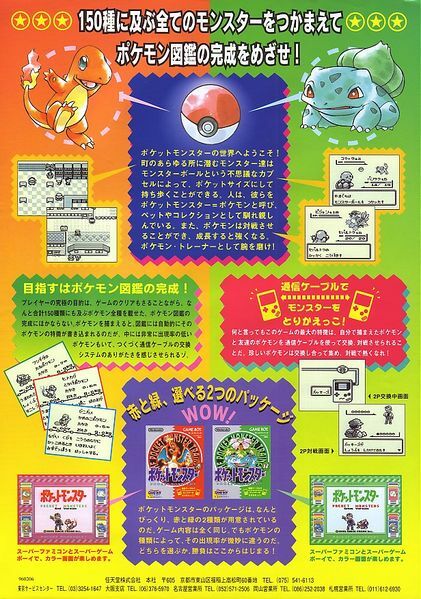 Outside of Japan, its graphics, game engine, and script formed the basis of Pokémon Red and Blue, while the wild Pokémon and game-exclusive Pokémon lists were changed to match Red and Green. Blue did not introduce any new Pokémon and so, the 151 present in Red and Green are the only ones obtainable. Like Red and Green, some Pokémon are missing from Blue and must be traded from another game to complete the Pokédex or evolved from less powerful forms. Pokémon Red Version and Pokémon Blue Version were the first Pokémon games to be released outside of Japan, becoming available in North America on September 28, 1998, in Australia and New Zealand on October 23, 1998 and in Europe on October 5, 1999. In North America, the pair closely followed the debut of the anime’s English dub, which began airing on September 8, 1998 and within a year, Pokémon was well known as a popular Nintendo franchise. On November 12, 2015, a Nintendo Direct announced that the Red and Blue games will be released in North America, Europe, Australia, and New Zealand on February 27, 2016, the Pokémon 20th Anniversary, for the Nintendo 3DS Virtual Console. Unlike later generations, Red and Blue were not the same as their corresponding Japanese releases Pokémon Red and Green. Besides Pokémon distribution, the aspects of Red and Blue such as graphics, script, and sprite designs are instead based on Pokémon Blue. Despite being released towards the end of Game Boy’s lifespan, they quickly became the best-selling non-bundled games released for the Game Boy as well as being the best-selling role-playing games of all time. Illustrating the original Pokémon gameplay concepts, the player begins his game in Pallet Town, a small town in the Kanto region, on the same day as his former best friend and now rival. Professor Oak calls the player to his laboratory, and allows the player to choose from the three Kanto starter Pokémon: the Grass-type Bulbasaur, the Fire-type Charmander, or the Water-type Squirtle. After the rival displays jealously, he chooses the starter that has a type advantage against the player’s chosen starter and challenges the player to a preliminary battle. Afterwards, the player leaves for his journey across the region, challenging 8 Gym Leaders and other Trainers until he reaches the ultimate goal: the Pokémon League at the Indigo Plateau. Similar to Red and Blue, Yellow arrived towards the end of the Game Boy’s lifespan. It managed, though, to receive the title of second best-selling non-bundled game for its console, losing only to its predecessors. On November 12, 2015, a Nintendo Direct announced that Yellow will be released in Japan, North America, Europe, Australia, and New Zealand on February 27, 2016, the Pokémon 20th Anniversary, for the Nintendo 3DS Virtual Console. Generation VII games heavily inspired by Pokémon Yellow, titled Pokémon: Let’s Go, Pikachu! and Let’s Go, Eevee!, are slated to be released worldwide for Nintendo Switch in November 2018, two months after Yellow’s 20th anniversary in Japan. I’ve played a few hours each of the original Pokemon games – Red, Green, Blue and Yellow – managing to capture and level up some of the Pokemon. As examples – in Pokemon: Red I chose Charmander and used it to help other captured creatures when their heath points were low. In Pokemon: Yellow – I went with the option of raising Pikachu and Rattata as primary battling creatures. I didn’t like the Green version that much because the translations were horrible and I played Blue only for a couple of hours. As I was saying – I want to start playing the FireRed version sometime the upcoming week and write an article regarding the walk-through, along with some videos I will upload on Youtube. Also regarding the soundtrack used in the games and which I absolutely adore – all the versions except Yellow have the same soundtrack, the Yellow version has three extra tracks. Game Boy: Entire Pokémon Sounds Collection CD (Japanese: ゲームボーイ「ポケモン」のサウンドがまるごと入って、遊べるCD) is the official soundtrack release for Pokémon Red, Green and Blue. You can listen the tracks on Khinsider’s Pokemon Sound Collection page and you can find out more about the music on Video Game Music Database page. This entry was posted in Anime, Blog, Culture, Games, pokemon on August 12, 2018 by Gratian.